Will the model year really make a difference if the upgraded 2018 Mazda6 just hit dealer showrooms last Spring, and the 2019 model isn’t expected until this Spring? The 2018 Mazda6 that I drove around town for a week was completely overhauled with many premium features, elegant styling, and new turbocharged engines. The 2019 model is expected to build on that success. Outside, it has a new grille design with standard LED headlights on each side. The 2018 Mazda6 also offers new 17- and 19-inch wheel designs. There won’t be any new design changes for 2019, but it will add upgraded features like driver assist technologies, adaptive cruise control, and full-speed emergency braking. It will come with a larger 8-inch touchscreen display, which will house the Mazda Connect infotainment system, a 7-inch instrument cluster and a heads-up display. Other premium luxury features will include a leather-wrapped steering wheel, a Bose surround sound audio system, Apple CarPlay and Android Auto, aluminum alloy wheels, a power sliding-glass moonroof, heated front seats, and Nappa leather-trimmed sport seats. The powerful performance and sporty driving experience of the 2018 Mazda6 base Sport model starts at $23,000 MSRP and is powered by a SKYACTIV 2.5-liter, 16 valve 4-cylinder with cylinder deactivation that generates 187 horsepower. The 2.5-liter turbo 4-cylinder is the same engine from the CX-9 crossover, which gets an impressive 310 lb-ft of torque at 2,000 rpm. All 2019 Mazda6 models will come equipped with the SKYACTIV® Drive 6-speed automatic transmission, which features a sport mode. The 2019 Mazda6 will also come standard with G-Vectoring Control, which provides excellent handling, especially around curves and corners. 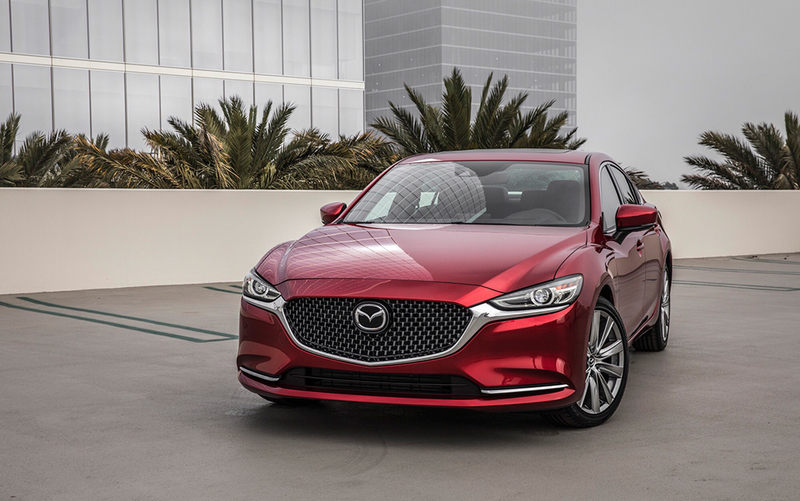 The 2018 Mazda6 Touring trim level is $25,700 and gets 187 horsepower; the Grand Touring is $29,200 and generates 250 horsepower; the Grand Touring Reserve is $31,700 and also gets 250 horsepower; while the Signature edition is $34,750 with the same 250 horses.